I was lucky enough to be treated to a perfect Maine summer day in March, courtesy of global warming, and I made the best of it. My luck started when the car rental company gave me a convertible. A brand new, fancy blue convertible. Then more luck when summer struck. It was 81 degrees, sunny and perfect. I picked up a friend and we drove down Route 1, top down, sunscreen on, radio up. And we ended up at Robinson’s Wharf in Boothbay Harbor. Robinson’s is a bustling restaurant and fish market in high season but on this lucky warm March day, it was open, empty and catering to locals. We got a table and ordered margaritas. Who doesn’t love a margarita served in a pint glass? Really, I didn’t think the Pabst Blue Ribbon glass boded well for margarita quality. I was expecting mix abuse when I took my first draw on the straw. But the taste that hit my tongue wasn’t sickly sweet or too tart. It was refreshing. A great drink for this lucky faux summer day. I did blow the happy hour price by agreeing to Patron when the server suggested it. He was nice and I let him up sell me even though I’m not a believer in the power of Patron. But I am a believer in the power of a lucky sunny day in Maine. 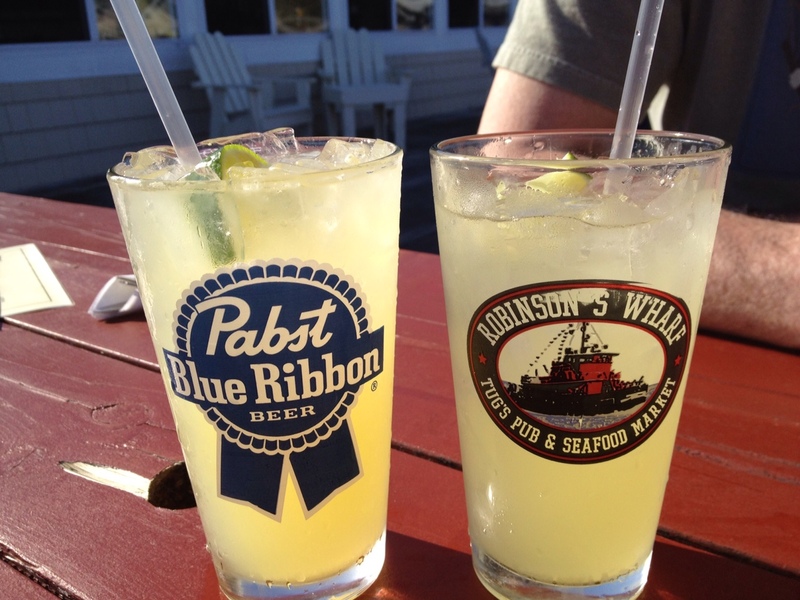 There’s more in Boothbay than margaritas. If you go (and you should) try candlepin bowling at Romar Bowling Lanes. The pins are tall and willowy. The bowling ball is the size of a softball. And the lanes have been in this spot for more than fifty years. There is also great ice cream, a harbor, fishing trips, puffin tours and endless charm. Maine perks way up in the summer. A lot of businesses are seasonal and even though the flowers were bursting and the sun shining, some of the best places weren’t open yet. A visit during the summer season promises more services but also more people. I guess you’ll just have to go more than once.